From Philadelphia to Sacramento, students fight to reclaim public education. Last spring, The Nation launched its biweekly student movement dispatch. As part of the StudentNation blog, each dispatch hosts ten first-person updates on student and youth organizing in the United States—from established student unions, to emerging national networks, to ad hoc campaigns that don’t yet have a name. For an archive of earlier editions, check out the New Year’s dispatch. In early January, the Portland Student Union held three days of action in support of the Portland Association of Teachers in its current contract negotiations. Jefferson and Wilson High School students walked out, while Cleveland High School student union members held three days of speakouts. Overall, more than 300 students participated in the days of action. 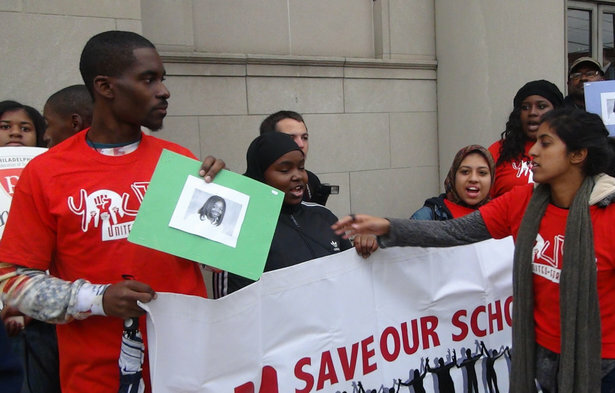 On January 13, the demonstrations culminated in a school board rally with 500 students, parents and workers. At the board meeting, the PDXSU presented “The Schools Portland Students Demand,” a set of priorities that students see as vital to their education. Ed Act Now, the movement for better federal enforcement of Title IX, was thrilled by President Obama’s January 22 announcement of a new task force to combat campus sexual violence. After garnering public support through a protest and online petition, student organizers met with White House officials in July to discuss their ideas. Ed Act Now is encouraged to see many of its proposals—including stricter enforcement of existing laws and greater federal transparency—included in a public memo outlining the task force’s plans. Activists are now working to ensure that the task force calls on a diversity of survivor voices—crossing lines of race, ethnicity, gender, sexual orientation, immigration status, type of educational institution and form of violence suffered—to inform the White House’s investigations. On January 7, a 16-year-old black boy, Darrin Manning, was sexually assaulted during a stop-and-frisk in North Philadelphia, leaving him potentially sterile from a ruptured testicle. Manning’s attorney is calling for a federal investigation, arguing that the patdown not only violated civil rights laws but also breached a 2011 settlement agreement between the city and a group of plaintiffs who claimed the police department’s stop-and-frisk practices violate the US and Pennsylvania constitutions. Techbook Online, a millennial-led news organization, organized a citywide town-hall meeting to address police corruption, brutality and misconduct, and has begun talks with the city’s Police Advisory Commission and the Police Abuse Witness Network to launch an initiative that gathers stories of residents’ experiences with police in their neighborhoods. Following an overwhelming vote from the American Studies Association membership for a resolution supporting the call of Palestinian civil society to boycott Israeli academic institutions, Palestine was also on the table for discussion at the 2014 Modern Language Association convention. On January 9, one panel, “Academic Boycotts: A Conversation about Israel and Palestine,” was attended by more than 150 members. On January 11, the delegate assembly voted in support of a resolution calling for the US Department of State to contest Israel&rsqo;s denying US academics, invited to work at Palestinian universities, entry to the West Bank. This vote came despite an FAQ sheet left on attendees’ chairs that misrepresented the academic boycott as targeting individual academics, distorting international law and inciting violence. It also falsely asserted that Israeli universities take progressive stands for peace and against inequality. The handout not only caused confusion, since there was no MLA boycott resolution, but also spread misinformation about a movement that is principled, democratic and nonviolent. Jewish college students across the country have begun to unify in protest of the current policies of Hillel, a Jewish organization located on college campuses nationwide. The current Hillel policies forbid students from collaborating under its name with groups that support political positions that it defines as anti-Israel. In a courageous display of defiance, the students of Swarthmore College’s Hillel voted to embrace a new set of guidelines proposed by Open Hillel, an organization started by Jewish students at Harvard. Open Hillel aims to promote free speech within Hillel’s walls, inviting students and speakers regardless of their beliefs about Zionism and Israel. As a national organization, Open Hillel has drawn supporters from across the country, as it continues to lobby Hillel to change its rigid guidelines. On January 16, more than 200 California students bused to the state capitol to march and rally for money that is meant to go to students who are low-income, English learners and foster-care youth. The Local Control Funding Formula, passed in July, allots funding from Proposition 30 to historically underfunded schools. On the same day as the rally, the state board of education decided to maintain “emergency regulations” that give districts flexibility to use the money for any purpose as long as they can prove that student outcomes are improving—without having to spend a dime on students who not only need the money but also make districts eligible for it. This spring, students across the state are organizing to monitor how districts implement LCFF in order to provide evidence that student input needs to be written into the final regulations. The board has until September 2014 to adopt the final regulations, which will be in place for the next six years. On January 14, we filed a complaint in the Milwaukee County Circuit Courts against the University of Wisconsin–Milwaukee administration after it decided to “not recognize” the results of our student association elections. In the UW system, students have rights under state law and subsequent case law to be equal partners with faculty, academic staff and the chancellor in the immediate governance of their institution. Until Chancellor Lovell stated in a letter that he would not recognize association elections, we, the students, were actively working and organizing in a manner that we determined, working towards implementing and institutionalizing student rights and formulating procedures that would make shared governance more collaborative. All that changed when the administration asserted that without its recognition and approval we could not organize. After asserting this, the administration took action to take away our legitimate representation and facilitated the institution of a puppet government. Through this case, we strive to uphold the collaborative concept of shared governance. 9. How Long Will OU “Guarantee” Tuition Hikes? On January 23, the Ohio University Student Union held its first demonstration of the new year: a forty-student bus blockade preventing the Ohio University Board of Trustees from leaving its meeting. The union demands that the board abandon the Ohio Guarantee Tuition (Hike) Model, scrap plans to build a methane gas plant on campus and use money normally awarded for administrative bonuses for scholarships for low-income students instead. The next day, the board agreed to meet with three union delegates to discuss the demands. Though the board chair expressed an unwillingness to accede to our demands, the union intends to use this meeting to educate and mobilize OU students for future direct actions. 10. Whom Does U of M Serve?